Written by Ronny Gunnarsson and first published July 17, 1998. Last revised January 23, 2018.
under construction. However, the table of contents provides a hint of the coming content. Qualitative methods does not use figures and numbers. Hence, they don’t use any kind of statistics. Qualitative methods are based on observations (empiricism) and use a holistic approach. 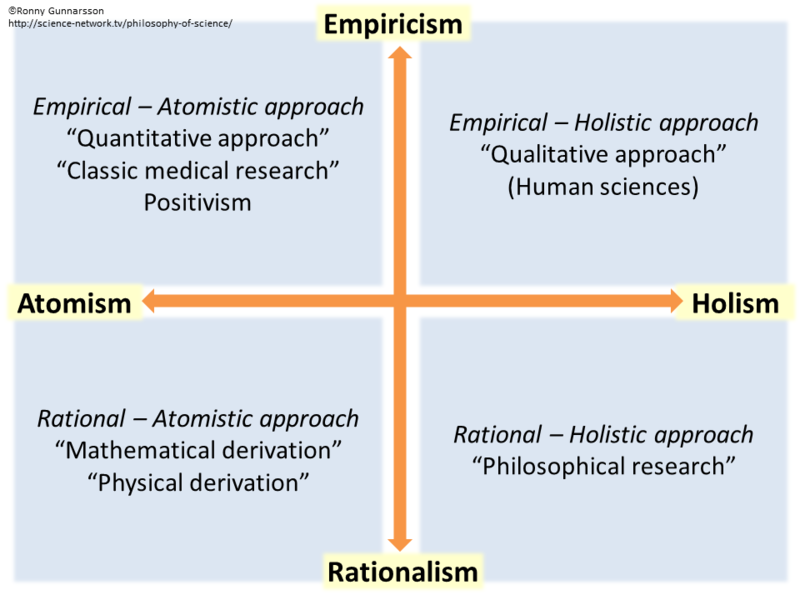 Hence, it is better to use the term empiric-holistic paradigm (=empiric-holistic approach) rather than the ambiguous “qualitative methods” (see figure to the right). This is elaborated upon further down. Research methods used within the empiric-holistic paradigm (“qualitative methods”) is more or less rooted in the philosophy of science. Hence, awareness of philosophy of science is considered more important when using qualitative methods compared to using statistics. Phenomenology and hermeneutics are example of methods with a strong link to philosophy of science. It might be worth mentioning that phenomenology and hermeneutics can refer both to an empiric-holistic method and to a specific philosophical orientation. 5 Choosing the best approach – the chicken or the egg? Epistemology is a major branch of philosophy, which, among other things, is about how we go when we develop new knowledge. Epistemology states there are four major types of paradigms. Paradigm (=theoretical frame = perspective). The world map of philosophy of science (figure above) shows four major different paradigms. Paradigms are the spectacles through which we see the world. Each paradigm embraces different methods that share the basic principles of this paradigm. The empiric-holistic paradigm, containing qualitative methods, is one of these four major different paradigms in philosophy of science. Method (Analytical method). Multiple different methods are used within each paradigm. Within the empiric-atomistic paradigm we have lots of different statistical methods. This page provides an overview of the different methods we have within the empiric-holistic paradigm. Data collection techniques (= data collection methods). To avoid confusion between “methods” I prefer to talk about “data collection techniques” rather than “data collection methods”. 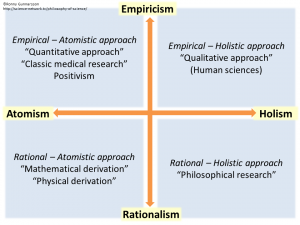 Research methods within the empiric-holistic (“qualitative”) paradigm has its roots more or less in philosophy, sociology and anthropology (se figure below). Phenomenology and hermeneutics are example of approached having a very strong link to philosophy of science and more specifically to the life world perspective first described by Edmund Husserl. Some analytical methods have a strong link to underpinning theories while others have a less pronounced link and furthermore some, like content analysis, has almost no link. Hence, content analysis is often referred to as a method without underpinning theory. The researcher should be aware of his preconceptions (= pre-understanding = preconceived opinions = prejudices) and how this may affect data collection and analysis. Collected data is encoded / transformed into units of meaning. Units of meaning are arranged and combined to form one or more categories. What kind of knowledge is most interesting? Is it the life-world perspective (as in phenomenology and hermeneutics) or human behavior with possible interactions with other people (as in grounded theory)? Should you begin to analyze data during data collection (as in grounded theory) or should all data be collected before analysis begins (as is usually done in phenomenology)? Do you think that the researcher, by being aware of their own pre-understanding, can be objective (as in phenomenology) or do you believe that the researcher interprets whether it is the intention or not. You may accept (and even embrace) interpretation if you think it is impossible to avoid this and instead let interpretation drive the process of coding data (as you do in hermeneutics). Some methods in the empirical-holistic (qualitative) paradigm have a clear and well-described approach when analyzing collected data. Examples of such approach is grounded theory. Other methods are not as well defined, such as content analysis. Within the research methodology phenomenology there are different variants of how to analyze. If you say that you have used a phenomenological method, you should also specify in detail how you have done. Sometimes reference is made to previously described analysis models (for example, phenomenological approach according to Giorgi’s methodology). Choosing the best approach – the chicken or the egg? The best approach when choosing which method within the empirical-holistic (qualitative) paradigm that suits best is to first first look at the aim of the study. You can do that by looking at the questions posed within brackets in the overview below. Based on this choose which method best your research question. This is the ideal order of events in the research process. It is quite common that researchers have a certain worldview and as a consequence are used to think within a specific paradigm. This may make them prone to stick to aims and research questions that is best answered by methods they are familiar with. A person who is well-placed in, for example, phenomenology is likely to get caught up in new issues that make it possible to choose phenomenology again. Thus, the interaction between aim/research question and selection of appropriate method is not always straightforward. Quite common a researcher choose aim and research question suitable for a specific method rather than the other way around. This is not necessarily bad but it might be good to be aware of the rationale for picking a specific method. Case study Provide an in depth description of a case and what we can learn from that case. A case can be one person, family, group, community, company, country, etc. Ethnography Aim to describe the characteristics of a culture (or subculture) and what we can learn from them. Grounded Theory Aim to develop a new theory around social phenomenons (interactions between people) based on (grounded in) actual observations. What happens and how do people manage? Narrative Analyse the stories people tell and offer possible interpretations. Phenomenology Describe lived experiences and condensate this to an essence of how this lived experience can be described. Biographical Study An in depth description and analysis of the life experience of one person. Action Research Studies Implement changes (actions) and describes what happens without aiming for generalizable truths. Hence, not using randomisation or calculating statistics. Content analysis Focus on finding (as in inductive content analysis) or verifying (as in deductive content analysis) a pattern among any data consisting of verbal or visual observations. Theoretical Domains Framework (TDF) TDF aim to identify barriers and enablers to change of behaviour. It is mainly used in implementation research. Methods focusing on language and communication between humans. Methods focusing on repeating events / themes / patterns in human life. These methods are looking for patterns describing the lives people live. They focus on human actions or the forms, patterns and structures forming daily life. Methods searching for meaning in people’s experiences or written texts. These methods have a life-world perspective trying to describe how people experience and interpret the world around them. They aim to acquire a deeper description, interpretation and understanding of people’s experiences. * Content analysis is unfortunately used for two quite different methods. One is a simpler form of method within the empiric-holistic paradigm. The label content analysis is sometimes also used when occurrence of different phenomenon is counted and described with descriptive statistics. This latter form of content analysis resides in the empiric-atomistic paradigm rather than the empiric-holistic paradigm. ** Action research has components of counting numbers and hence is not purely a method within the empiric-holistic paradigm. Concept analysis focusing on the question “What is the significance / meaning of the concept…?” …is often used in qualitative research. However, concept analysis is not directly an empiric-holistic approach. It lies within the rationalistic-holistic approach (philosophical research). Ronny Gunnarsson. Introduction to qualitative methods [in Science Network TV]. Available at: https://science-network.tv/introduction-to-qualitative-methods/. Accessed April 23, 2019.